Artificial Intelligence Law (AI Law) regulates the use of artificial intelligence. It is an aspect of and closely related to robot law. People often mistake the use of AI by lawyers and the impact it has on the legal profession as AI law. But AI Law really refers to the application of the law on AI. There are various aspects to artificial intelligence law including data protection, intellectual property, ethics, politics, social and of course technology. Currently, we all use AI in our daily lives with applications like Siri, video games like Call of Duty, purchase predictors like coupons or advertisements, machine learning, and bots. Many organisations are using artificial intelligence (AI) to improve our lives by developing chatbots to answer people’s questions. AI is making decisions about people, like whether to grant then a loan or finance a vehicle. Like technology, artificial intelligence has changed rapidly over the last few decades. It has made our lives so much easier and saves us valuable time to complete other tasks. Like any new concept, there is the possibility of malfunctions and disadvantages. In 1927, the movie Metropolis introduced AI to the silver screen and movies like Chappie and Blade Runner 2049 are more recent films. We are entering a period of neo-humanism – a new era of mutation towards robo-humanity. Do we need to define it yet? Sundar Pichai says “AI is computer programming that learns and adapts“. Artificial intelligence is the development (or theory) of computer systems that are able to perform tasks that normally require human intelligence. AI is not a natural or legal person, but a robot or artificial person. When people think of AI they think of humanoid robots, but artificial intelligence is so much broader. Other types of AI include machine learning, bots, and driverless cars. AI has characteristics that enable machines to operate independently of human intervention. These characteristics include reasoning, knowledge, planning, communication, and perception. These characteristics allow them to assist humans by creating easier solutions to everyday tasks. Scientists have developed programs called neural networks that process huge amounts of information and perform in a way similar to that of the human brain. By feeding the programs large quantities of data, it has the ability to cross-compare, eliminate and accurately identify a solution and make a decision. Essentially, making a better decision than a human would. These programs have been used to diagnose diseases and predict financial trends. With a developer boasting the accuracy of the decisions made by AI in the medical field, there might be the potential that doctors’ jobs would be at stake. 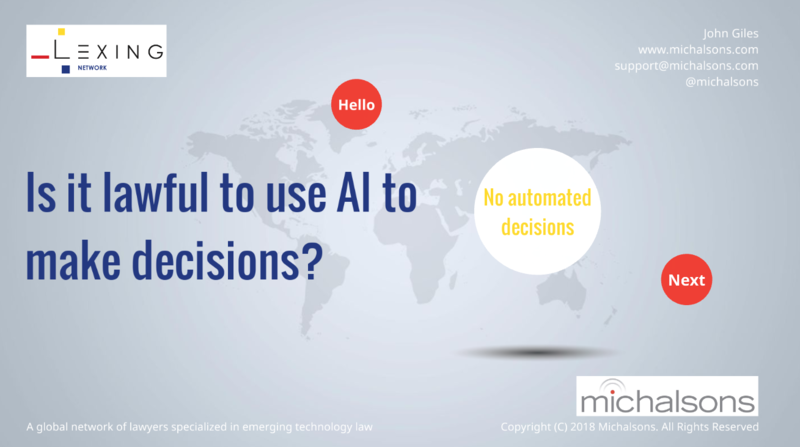 Laws like the GDPR and POPIA regulate automated decision-making but could this result in the prohibited use of the decisions made by AI? The Board’s Guidelines on Automated individual decision-making and Profiling has addressed important topics on the decisions made by AI and the effect it has on the rights of data subjects. What are the legal issues relating to artificial intelligence? Is AI capable of committing a crime and who will monitor this? Is there a need for legal requirements in code writing to ensure the AI behaves within the law? What will the punishment be for using AI to commit a crime? How will AI comply with the international humanitarian law given its interaction with humans? Does the AI or its creator own the intellectual property it creates? If AI creates new content outside of its code, who does it belong to? The application of data protection law to artificial intelligence? Would AI constitute a legal entity or would it have to adhere to legal social control given its growing intelligence? Can AI have rights in anything? Must we grant all humanoids citizenship? Must AI’s have rights and should they will have the same rights as natural persons? The Saudi Arabian government granted citizenship to Sophia (a humanoid) in November 2017.
Who is labile for the damages suffered by people as a result of AI? How do you certify something that is not set? AI is not set – it keeps on evolving. How do we avoid bias and discrimination? How do we regulate the use of automation and AI for marketing and propaganda purposes, especially in the context of elections? At the moment we are asking more questions than answering them. Legislators must address the challenges surrounding AI and the law. It is difficult to address these legal issues without the proper laws in place. As time passes it will be easier to identify the legal issues around AI. How can we help you regards artificial intelligence law? Know what laws, rules, codes or principles apply by getting our legal guidance on AI law in your jurisdiction. Comply with data protection laws whilst using or developing AI by getting our assistance with privacy and data protection. Obtain legal certainty by asking us to provide you with a legal opinion on one of the legal issues of artificial intelligence law. Deal with incidents relating to the use of AI effectively by asking us to provide you with an incident response policy. If you have a question or require another deliverable that we have not mentioned, please complete the form on the right of this page and we will contact you. Various thought leaders have raised their concerns regarding the use of AI and the damage it may cause to the human race. The current artificial intelligence laws cannot regulate the use, manufacturing, behaviour, and responsibility of AI. Although there is a need to implement regulations, how and to what extent AI should be regulated is difficult to grasp given its fast-paced development. A balance between protection and innovation will need to be found. This is a global issue and we must address the development of AI law on a global level – we need a new universal law. During its development, it may require amendments to other laws and could result in changes to common law principles. Legal professionals must include the developers of AI in the drafting process to address the technical issues. Based on the warnings from thought leaders like Elon Musk and Bill Gates, we cannot ignore their concerns. Considering the representation of AI in Hollywood movies it’s questionable whether AI will cause the end of the world. The Information Commissioner’s Office (ICO) in the UK published a paper on big data, artificial intelligence and machine learning in March 2017. Data protection laws will overlap with artificial intelligence law as AI can process personal information and make automated decisions. The paper also addresses machine learning, which is the concept of allowing machines to access information and learn themselves. Google has released their principles for AI at Google. The latest development in AI law is the Case Cruncher Alpha. Casecruncher Alpha was born as a Chatbot who merely answered legal questions but can now predict the outcome of cases. The Casecruncher Alpha solution has the potential to expedite court decisions and outcomes. Many law firms use AI in their practice and there is the possibility that AI will replace lawyers and many other professions. This video gives you a glimpse into the world of Sophia and artificial intelligence today.